There are many different ways to distill the lessons of the Bible. It is such a wonderful book and worth studying for a lifetime. 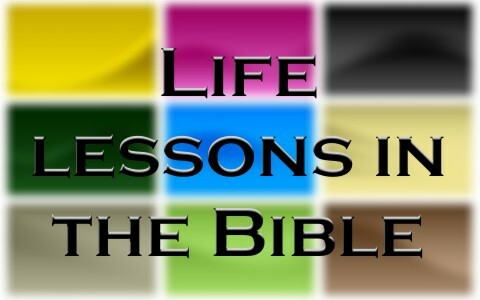 Here are 7 life lessons from the Bible. We could certainly look at many more, but what I have tried to do is give a big picture idea of some of the concepts taught over and over in the Bible. One of the major themes of the Bible is to find out what God says and obey Him. We are familiar with the 10 Commandments and that is a good place to start, but it is certainly not all the Bible has to say about loving God and our fellow man. In the Old Testament we are taught the “letter of the law” and how we should obey God’s commands. But Jesus taught us in the New Testament that the “spirit of the law” is just as important (Matthew 5:21-48). A good story from the Old Testament that illustrates obedience to God is the story of the life of Joseph. He certainly had his share of hard times and difficult situations to deal with, but he was guided with the simple principle of obeying God and doing right by others around him. His story is found in Genesis chapters 37 through 50. We can think of many people in the Bible who had gotten themselves thrown into prison or sentenced to death. But the interesting thing is that many of the stories of people dealing with authority problems show us that these men and women were still submissive to authority even when they found they could not obey authority. Submission and obedience: what is the difference? Sometimes we find that we cannot obey what authority asks us to do. It may be that the authority has asked you to do something against God’s law. Shadrach, Meshach and Abed-nego are good examples of this. They were told by the king that they must bow down to a statue and worship that image. Knowing God’s Law, these three young Jewish men refused to obey authority, yet they were still submissive. They accepted the punishment that the king and his government pronounced upon them. We are told in Romans 13:1-6 to submit to authority. And we are told by Peter in Acts 5:29 that he knew it was right to obey God rather than man’s laws that went against God. There is no conflict in these two passages. We should obey God’s laws rather than man’s laws; however, we should also be willing to submit to the punishment and consequences that may come our way as a result. The vast majority of the time there is no conflict between submission and obedience. We just like to use examples of disobedience to authority in the Bible as an excuse to do things our own way. Besides submission to authority, Romans 13 teaches us a wonderful definition of love. In verse 10 we are told, “love worketh no ill to his neighbour; therefore love is the fulfilling of the law.” Or as a friend of mine summarizes that verse: love means doing what is right towards others. Love is not always easy or convenient. But love is always right. In some cases love may mean withholding something from someone. Love may mean giving something at great personal sacrifice. Love is doing what is right and best for the other person in each situation. God is touched by our humility. Second Chronicles 7:14 says that if we will humble ourselves before God, confessing and forsaking our sins, He will hear our prayer and forgive our sin. Without this humility, we would still be in our sins. I am thinking of a dear friend right now who, as far as I know, died without the Lord as his savior because he refused to allow Christ to forgive his sins. My friend said that he should be able to save himself with his own good works. He would not allow anyone or anything take responsibility of his deeds. Before you think of my friend as a wicked heathen who thumbed his nose at God, I have to tell you, he was one of the sweetest, kindest men I have ever met. He really had done many marvelous things in his life. He had been loving and benevolent to those around him. He was greatly loved and respected by the community where he lived. Yet, my friend was too proud to allow the Lord Jesus Christ to forgive him of his sins. My friend was very much like many other people who feel they can earn their way to God and do not need to humble themselves for God’s forgiveness. I am reminded of another story in the Bible. If you have not read the story of Esther, you should take some time to study the character named Haman. A quick summary of Haman is that his pride caused God’s wrath to come down on him. People often misquote 1 Timothy 6:10 thinking that it says money is the root of all evil. What the verse actually says is that the love of money is the problem. Money easily becomes an idol. People begin to worship money and the pursuit of it more than worshiping God. Certainly money is necessary to live in this world. Though we haven’t always had paper money like we have today, there has always been a way to buy and sell either through trading other goods or various representations of wealth. The Bible has a surprisingly large number of verses concerning money, especially in the book of Proverbs. Even though we should not lust after money, we do need to be wise in the way we handle it. And, no, it is not a requirement to be poor to be a good Christian. Read all of 1 Timothy 6 to see some great teaching about money and wealth. Paul does not condemn the rich in verse 17. Rather, he encourages them to trust the Lord, not their riches. Then he says in that verse that God gives us things to enjoy. There is nothing wrong with enjoying nice things. The problem comes in thinking stuff will make us happy. The point of the passage is that we should be godly (do what is right) and content (satisfied with what God has given us). We see that clearly stated in verses 6 through 11 of that chapter. What we sow we will reap. The Bible teaches that in various places and ways. In the Old Testament we are told in Numbers 32:23 that our sins will be made known and catch up to us. There is nothing secret before God. In the New Testament we see 2 Corinthians 9:6-8 and Galatians 6-9 which teach the principle of sowing and reaping. A great way I have heard this Bible principle taught is that we reap what we sow (of the same kind), we reap proportionately to how much we sow, we reap more than we sow, and we reap later than we sow. This means that if we sow good, we reap good things. If we sow evil, we reap evil things. Then if you sow very little you will reap proportionately very little. However, you always reap more than you sow. Even though it is proportionate it is still abundantly more than you plant. If you sow one grain of corn you reap one stalk with many ears. But if you sow a whole row of corn, you will reap many more stalks with many ears and thousands of kernels. Finally, you reap later than you sow. Harvest time is coming in the future. Will your harvest be good or evil? I was listening to a Human Resources coach speak recently and he said that it is not always possible to resolve every conflict, but it was possible to manage conflicts. The Bible teaches us to live peaceably with those around us (Romans 12:18, 19). We are taught the Golden Rule from childhood: treat others the way you want to be treated. That is a principle straight from the pages of Scripture (Matthew 7:12; Luke 6:31). Matthew 18 is the classic passage on conflict management. The first thing to do is go personally to the person who has done wrong toward you. Try to resolve the conflict individually. If that does not work, then take two or three other people with you to try to work out the problem. This way you have people who can be witnesses to what is said, the problem can be clarified and you have other input to help see where the real problem is. If the problem continues, then take it before the church and deal with it as a public matter. The progression is to keep the problem as private as possible. Only escalate the conflict when it cannot be solved privately. Don’t go around gossiping and making your private matter a subject of public news. There are certainly many other lessons that the Bible teaches. These are 7 that came to mind quickly. You are welcome to share in the comments below other life lessons that you enjoy from the Bible. I’m a 15 year old and I’ve grown up knowing the lord but I find myself falling short in following him. I want to further my understanding of the lord sso does anyone know a good chapter or lession in the bible that I could read. I’m actually in the same boat as you, I think it’s best to start reading three of the Books of Wisdom in the Bible, which is Proverbs, Ecclesiastes, and Job. I hope this helped :)…. Don’t give up! Have faith! Ethan, I have been with god for many years and I am only 26 years old now. It is hard understanding everything about religion and god but trust me, it is worth it. I like to study a few verses of the Bible over a few months time to see how they relate to my life. One thing I found recently is that if you focus on the good things in life. Good will surround you. Also put yourself around positive/encouraging people will help out a lot too. Remember life is not always going to be easy but you have the Holy Spirit to strengthen you when you are weak. Sometimes I feel the spirit running through me when I Least expect it. God bless! Excuse me? No problem in being a wealthy Christian? Maybe you should read the Bible again, seems to me like the author picks out his verse as they suit his need. Read this here! Abraham was rich, so was King David, so it is not sin to be rich and enter the kingdom. Many are not rich, but a rich man can enter as Jesus said,”with men, it is impossible, but with God, allthings are possible (Matt 19:26; Mark 10:27). You took Matt 19:23 out of it’s context and didn’t read the entire context, up to Matth19:26. That is proff texting and leads to error. IMO, Matthew 19:23 compounds what the Bible teaches about wealth. It can lead to worship of money instead of the Lord, hence the hardship of a rich man entering heaven. My father was not rich, but in land and equipment he was not poor. But he was a humble and fair man in all dealings. He followed the Lord and lived by the Word, my heart tells me his soul rests with God now. Good content here.